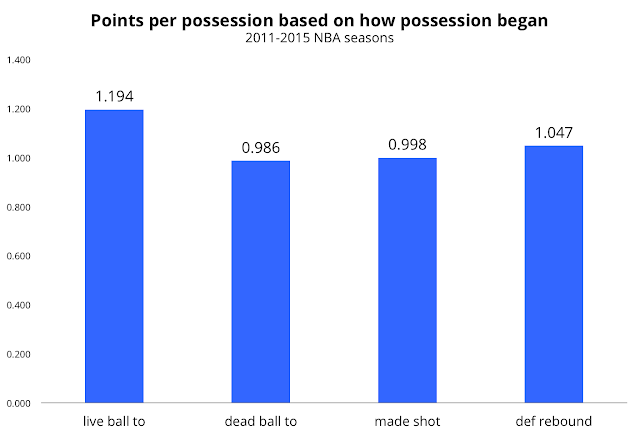 Possessions off of dead ball turnovers are slightly less efficient than possessions off of made shots, and clearly less efficient than live ball turnover possessions. This is all intuitive, given that a made shot creates a quasi-dead ball situation due to the inbounding process. For that reason, I will be making a change to my per possession statistics tool. Dead ball turnovers will now be grouped with "After Made Shot" possessions. I could create a separate category, but I'm running out of real estate on the page, and would prefer to keep things simple where I can. And the efficiency graph above supports grouping dead ball turnovers with made shots. In case you are curious, here is a summary, by season, of the % of turnovers that are live ball. Note the drop in percentage for the 2015-16 season. Does this mean teams are getting more careful with the ball? Are referees calling more offensive fouls? The actual answer is more mundane. 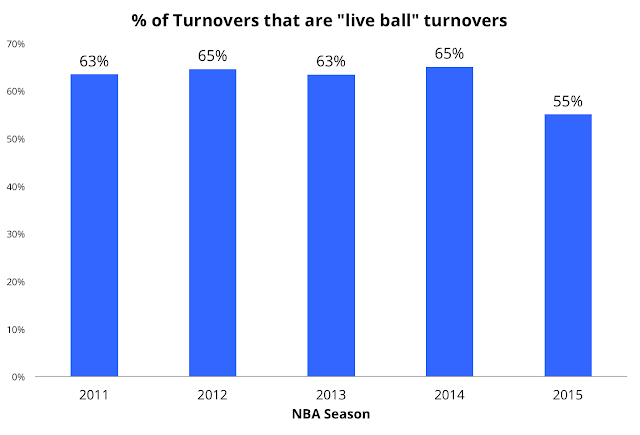 For the 2015-16 season, the NBA has added an additional turnover category to their play by play data. Prior to this season, "bad pass" turnovers were a single category, and could include bad passes that go out of bounds (i.e. a dead ball turnover). There is now a separate category for out of bounds bad pass turnovers, and the 10% dip in live ball turnovers is almost wholly attributable to this new split.